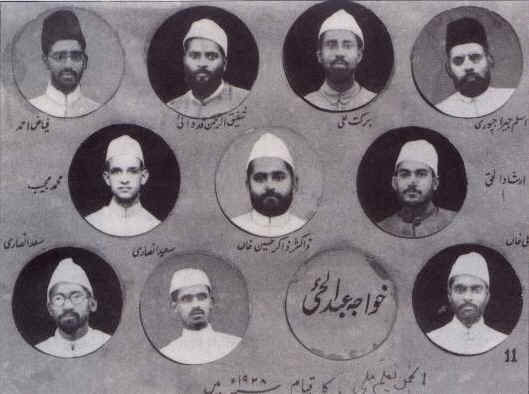 In 1928 the Staff members of Jamia Millia Islamia under the aspiring leadership of Dr. Zakir Husain resolved to form the Anjuman-e-Talimi-Milli (later to be known as Anjuman-e-Jamia Millia Islamia) whose members signed a pledge to serve Jamia for at least 20 years on a salary of not more than Rs. 150 per month. The following signed the pledge in the first instance. Janab Khawaja Abdul Hai not shown in the photograph.